The world’s best bucket list? To be completely honest, I had no idea what to write about when I started blogging. Blogs can be about whatever you want, and you’re supposed breathe life into it and add your own signature twist, so I tried Googling prompts and topics. The one shred of advice I found most helpful was to think of my goals and get those goals across to other people. I’ve already achieved a lot of my goals. Great grades, graduation, moving out… just typical things a recently graduated High School Student would put in a blog. So instead of discussing my goals, I decided to focus on the rest of the worlds. 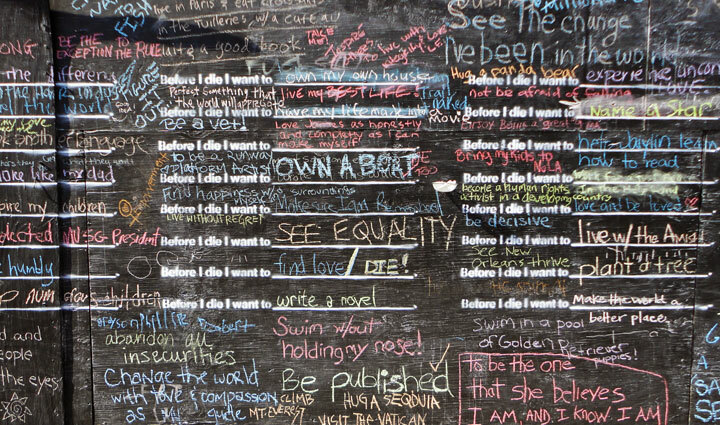 Pictured above is a snapshot of a “Before I die…” wall in New Orleans. The wall is stenciled with the incomplete sentence “Before I die, I want to…” and paired with simple side walk chalk, so that anyone who happens to be walking by can write on the wall their hopes, dreams, and goals. However, the reason I think “Before I die” walls have spread all over the world is because the goals make us think. Consider chalking’s like, “Before I die I want to see equality” or “live my BEST life”. These have spread because a stranger’s hope makes us reflect on what we really want to be doing. Do we really want to spend the limited time we have here on Earth worrying about material things, trends, and trying to impress others? Hopes, dreams, goals, and achievements are limitless. And all I see and experience in today’s society is showing me we limit ourselves by any means necessary with constant excuses not to achieve. There’s always going to be a million reasons not to do something, but I feel like if we stop for just a moment, and think carefully on it, we’ll find what we truly want to do with our lives. We can make a difference in the world, whether it’s by becoming a doctor, a great musician, or just being yourself. We need to stop lying to ourselves. Have no excuses. Dive into life, and embrace everything in it. What would you write on the wall ? Maggie Watkins is a “Drunk Girl”? Welcome to Overseas, all the way from Costa Rica!